The British government has postponed plans to build an airport on the tiny south Atlantic island of St Helena. What is it like living on one of the most isolated settlements on the planet? The RMS St Helena is the only way anything - people or cargo - gets to St Helena. It is the last remaining dedicated Royal Mail ship and as it slowly ploughs its way through the south Atlantic, sailing between Cape Town, Ascension Island and St Helena, it would be tempting to say it represents the island's lifeline, only for St Helenians it is even more than that. Among the passengers, Robert Newman is on the way to attend the funeral of his father, the former chief of police John Newman, who recently passed away on St Helena. "My dad died much quicker than we expected," he says. "I came to see him last month and I've been very lucky that the transport has worked out so that I can be here for the funeral. "I've really only managed it at all because of my contacts at the MoD." Mr Newman left the island to join the British Army and now lives in Hereford and serves with the Royal Signals. He has taken a long-delayed RAF flight from Brize Norton to Ascension Island, meeting up with RMS St Helena for a three-day sail to the island. Fortunately the boat waited for the late-running plane. It's rare for the journey to be even this easy. Often there can be weeks between sailings, and when the ship is being serviced, none at all. The return flight costs more than £1,000 and the return boat trip from Ascension to St Helena about £1,600. Perhaps because the island is so hard - and costly - to get to, St Helena is often said to have been frozen in time, a slice of yesteryear Britain, and arriving on the island, it's easy to see why. Steep rocky slopes rise almost from the sea, but nestled in a gully in the otherwise rocky terrain lies sleepy Jamestown. Part incongruously-hot Yorkshire village, part colonial outpost, ancient Ford Escorts pootle up and down its short High Street while people - seemingly for hours at a time - park themselves on benches to chat and look on. There are no chain stores here and the handful of local shops knock off for the day at 4pm. Wednesday is a half-day and few businesses open at all at the weekend. 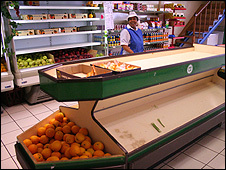 Inside the Star supermarket, despite the ship's recent arrival, there are still many empty shelves. Only carrots, marrows, cucumbers and potatoes are for sale in the vegetable section. "This actually isn't too bad," says shopper Bronwen Yon. "Some days the whole place is empty. In two weeks, there'll be nothing left again." She explains the kind of strategy you need on an island served by just one boat. "You have to plan when you're going to buy things. If the ship comes in from Cape Town, you'll know it will have things like butter, cheese and sugar. "It's probably hard to get your head around if you're not from here but even simple things like this you need to stock up on when you can. "You'll know exactly how long after the ship arrives the goods will appear on the shelf and you'll buy a month's worth. You learn these things." But not everyone is prepared to put up with such a life. 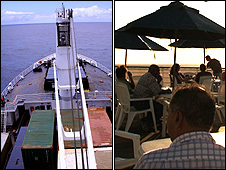 Once St Helena used to be a service station on the oceanic motorway, receiving a thousand ships a year. But since the aviation age arrived and with such poor modern communication links, the economy has been slowly throttled. There is a saying that every time the RMS leaves, it takes two families with it. The average salary on the island is just £70 a week and one in four so-called Saints have moved away in the last 10 years to seek better-paid employment overseas. And when they do it is the older members of the older generation - like Melvina Caeser - who are left holding the baby. She is raising four of her grandchildren while their parents are away working. Such an informal foster arrangement is common on the island. And when these children grow up they too will almost certainly leave. "It's difficult but there's no choice," she says. "Food is expensive, clothes are expensive. That's why people have to go away. It's hard for the children as they don't have their mummy here but I still love them like my own." When the airport was originally promised it was with the idea of stemming this human tide. St Helena currently costs the UK about £20m each year to administer and while the airport would cost £300m, it was hoped that it would enable the island to become sustainable. There was some resistance to the plan, from those who thought an influx of people would risk the island's close-knit atmosphere. But in December, the UK government announced it was to postpone a decision for the second time, a move that was greeted with some anger. "Some people are stuck in their ways - they don't like change. 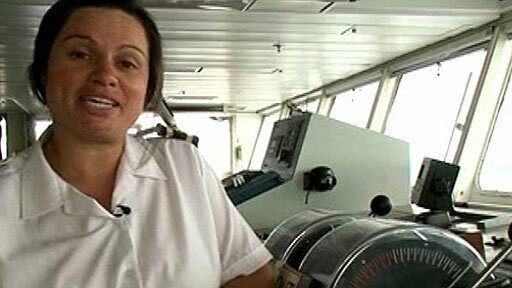 They're afraid an airport might bring terrorists to the island or something," says Annabel Plato, a hotel worker. Annabel herself moved away to the UK, working as a housekeeper at Althorpe House, but airport or no airport she's glad she came back. "It's like a village. People say hello to each other and always try to help one another," she says. "If there is a funeral or a wedding for instance and there's a shortage of flowers, people will cut them from their gardens to help out. It's really nice and it's something you appreciate much more after you've been away." Despite the lack of links with the outside world, Annabel says she doesn't feel cut off, pointing out that there are landlines, television and the internet. True, but the internet bandwidth for the entire island is less than that of many individual households in the UK, and costs £6 an hour, while locals say the phone lines - all with retro four-digit numbers - run out of capacity at times. In the Standard pub, the regulars puff away around the bar. There is no smoking ban here. They agree that it's only in emergencies that St Helena's remoteness is really brought home. "A friend of mine became seriously ill while the ship was back in the UK, " says Geoff Stevens. "By the time the ship got back and took him to Cape Town it was too late. He died on board." For visitors, like Mike and Lynda Vincent, the remoteness makes St Helena special. "You're completely incommunicado. It's one of the few places in the world where that's the case. It's definitely an attraction," says Mr Vincent. Attracting more tourists is the only plan for the island economy, but Jamie Roberts of the National Trust sees a paradox here. "Remoteness is one of the major appeals. It's one of the things that made me want to come here. There aren't many places left in the world that can take you six days on a boat to get to. "If people could fly here to the UK in seven or eight hours, it would definitely take away from the romance." In 1964, with a wife and two small children I was appointed to look after The Salvation Army's three churches on St Helena (five services every Sunday). We were also engaged in relief work on behalf of Oxfam. Those were challenging days and years, in a unique and wonderful setting. Annual holiday was taking the 15-mile drive around the island. Great people, and our hearts often return there with only the choicest of memories. But if only we could return there, to meet again some of those folk we knew, and see again some of the sights that are uniquely St Helenian. But - impossible. Lack of realistic transport facilities and enormous costs put a visit well out of our (and most people's) reach. In 1965, two British MPs visited the island to look at improving transport and other services. Then, and once again, the outcome was unproductive. Britain owes its loyal Saints. I have lived on St Helena all my life. I have been fortunate in having the opportunity to live and visit a good few countries, but for me St Helena is and will always be home. The last thing I would want to happen is for the peace and tranquillity of the life that I enjoy here disrupted in any way. However, if St Helena does not become accessible by air then our community will certainly dwindle to nothing. We were promised an airport in 2002. During this time millions of pounds have been spent on various studies - consultants have come and gone in droves, at huge expense. If this isn't a waste on British taxpayers money then I don't know what is. We are not asking for a big international airport as the possibility of tourists queuing to come here is rather slim. All we need is a small airstrip that will enable flights to move between St Helena and Ascension Island. We have been for over 300 years loyal to the British Crown, our island was used during the time that Britain was developing its trading links with the Far East. Our people have supported the Motherland and fought in the two world wars, the Falklands War, Iraq and Afghanistan - what else have we to do to be treated as other citizens of the United Kingdom? My grandmother was St Helenian and I have traced her family back to the 1790s on the island. She and all her sisters left when they married British soldiers stationed there during the Boer War. Whilst such a remote existence lends itself to an idyllic lifestyle, that is just a romantic notion. Even in the 1890s the girls knew they had to leave to have any sort of life and the British Garrison provided that freedom. Neither my grandmother or her sisters ever went back. I suspect access was even harder in those days. Her brothers also left, as records show no trace of them marrying or dying on the island. My brother and I always say we would love to visit - probably family still there, but as we are now pensioners it will probably remain a dream. While the romance of distance maybe appealing the need to bring access to the island should come first. Having lived and worked on Ascension Island for 12 months I have a basic understanding of how difficult it is to purchase everyday essentials such as fresh fruit and veg. I use to shop at Asda online and have a shipping company send my order out to me via the MoD ship, this meant shopping three months in advance. The people of St Helena are warm and friendly and I can understand that there maybe some that do not want the island opened up by an airport, however the obvious need to bring in produce and goods is evident, and the need for emergency services and hospitals even more evident. The British Government want to wake up and look after their own people as well as they do people of other nations. Sounds idyllic, delightful that they want to keep it unchanged and village like. Until you realise that it only exists through subsidy at £20m and a Royal Mail ship. That's £5200 for each person. The sun set on the empire and the big ships along time ago. Sad but true. 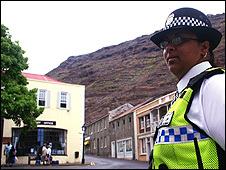 My wife's family comes from St Helena where the people are incredibly pre-British and law-abiding. However the support from the government is poor and all too often the funds are spent on UK-based "consultants" who go to the island for a paid holiday to produce a report that nobody in London ever reads. Now the vital airport has been postponed (=cancelled) because the funds are not available yet DfiD department is able to give one of the richest countries on the planet, China, some $250m of aid each year. This is the place I want to be. Its almost like where I work. Its about five and a half hours drive, partly through a dusty forest road from the big city - Kumasi or Takoradi. Here at the Bia National Park (where I am one of the assistant park managers), life is pretty simple and inaccessible. It makes me feel happy and important. But here, there is reception for one mobile phone company, no landlines and the internet is only by the modem of that mobile company. The rest of Ghana is an age away. I love it! I believe that at one time residents of Saint Helena held British passports that entitled them to live on Saint Helena and nowhere else. They were basically in the same situation as Napoleon. Is that still true? Another question. What about hospitals on the island? Are there any? If you'd like to sample life on a remote island, but a lot nearer to home, try Foula, 14 miles west of the rest of the Shetlands. No shops, no law, the post office is somebody's porch... quite an experience. Main hazard, very aggressive birds. Jenny, Foula is not the "lawless" island she might have others believe. There is no resident police force, but an officer regularly visits the island and is only a boat ride away. And by the way, post office porches can be found all over rural Scotland.